Capital of the region of the Ripollès (1), the municipal area of Ripoll is mountainous and is articulated around two rivers, the Ter and Freser. Covering nearly 74 km2 and with a population of nearly 11,000 inhabitants (2), Ripoll communicates with nearby towns and villages by road, with the Garrotxa through the Vall de Bianya tunnel, while having easy access to France via the Barcelona-Vic-Puigcerdà train line (3). Located on a privileged point of Catalonia, in a region with great natural and historic heritage, Ripoll is home to one of the most complete and interesting Romanesque constructions in the whole of Europe. 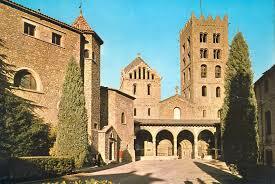 The Monastery of Ripoll is a monastic ensemble of the 12th century that has been rebuilt over the course of the centuries. It disposes of an Interpretation Centre providing the tools to be able to penetrate into the history and charm of its history in a more didactic manner. If one looks at a map and observes the area surrounding Ripoll it is easy to see that here nature opens itself in front of the eyes of the walker, with a series of marked trails like the routes of Sant Bartomeu, Sant Roc, Sant Antoni de Morers or of Santa Maria de Catllar all with viewpoints that present one with indescribable panoramic views.